Kiddo and Hawkshaw (nicknamed Toes – he has 7 toes on one paw and 6 on all the other!) are two sweet, playful kittens available for adoption. Though not from the same litter, the two quickly bonded and are a close pair. They can be found playing together, napping together, and grooming one another. Kiddo (brown tabby) is a very sweet, social and playful kitten. He is engaging and likes to be with people, and will purr contently if you pet him. Hankshaw was a little more shy at first, but has been quickly blossoming into a very social kitten as well. He loves to be brushed and he loves playing with his mouse toy. This adorable pair will make great furry companions! 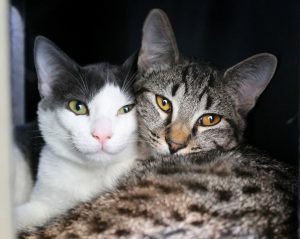 They are about 6 months old, vaccinated, micro-chipped, and neutered with an adoption fee of $135 each ($243 for a pair). They are currently living in the Pixie cattery, so come by the shelter to meet them today!